The historic Shaniwar Wada fort is not just Pune’s pride; it is the pride of Maharashtra and India. It was the citadel of power of the great Maratha Empire of the 18th Century. At its zenith, the Maratha Empire controlled an area over half of present day India and rivaled the size of the Mughal Empire that preceded it. The Peshwe were amongst the last major powers to surrender to British in 1818. Small and modest in comparison to the Mughal Forts like the Lal Kila in Delhi, the Shaniwar Wada had its own charm, and was witness to some very important history of the Indian sub-continent in the 18th century. 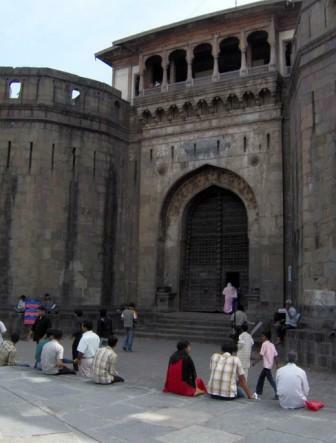 For more information on Shaniwar Wada, please click here. A massive fire in 1828 destroyed most of the buildings inside the fort. Only the foundations, the periphery walls, and the main entrance survived. The exact cause of this fire is not known. Post this fire, the British had no interest in rebuilding this symbol of Maratha Power. The fort deteriorated over the coming decades. Post independence, Shaniwar Wada saw some restoration work and development. I recently visited Shaniwar Wada after nearly 25 years. Being a big enthusiast of Pune History, I was eagerly looking forward to seeing the sites of the historic buildings, and the beautiful water fountains. I was extremely disappointed. The condition of the fort is disturbing. Apparently, some restoration work is going on, but that’s no excuse for the current state! And the person at the ticket window (they charge Rs 5 entrance fee; Rs 100 for foreign visitors) confirmed that this state has been there for a while. Nearly half of the sign-boards inside the fort, that describe various buildings and structures, are missing. Partial restoration work/construction can be seen at multiple sites, and construction material is dumped haphazardly at various places. Pieces of trash can be seen lying everywhere. Lawns are not maintained properly. The periphery outside the main walls of the fort has a small iron fence, creating a 10-20 feet buffer zone between the fort and the streets. This fence is broken at a few points. The grass here gives an impression that no one has tended to it in years! And it has become a mini-garbage dump. Most public gardens in Pune are maintained so much better than this historic monument. And they don’t even charge an entry fee. Question is who is responsible for maintaining this fort? Is it the Archaeological Survey of India (ASI)? I understand that the ASI does a nice job in maintaining historical monuments like the Lal Kila, Ajantha, etc. (This is what I have heard from friends who have recently visited there… I haven’t been there in a long time). Then what is the problem with Shaniwar Wada? Funding? Priority? What Else? What can be done to get the attention of the right authorities? Is a ‘Public-Private Partnership Model’ an option? What can Punekars do the restore the pride and glory of this great monument? Looking for your suggestions and inputs.